I recently came across one of the oldest family documents I have an image of: the marriage record of my 10x great-grandparents George Morton and Juliana Carpenter. And it’s the only one in Dutch. George and Juliana were refugees who fled religious persecution in England. Together with their fellow Separatists, they were welcomed in Leiden and spent many years there before migrating to Plymouth Colony. 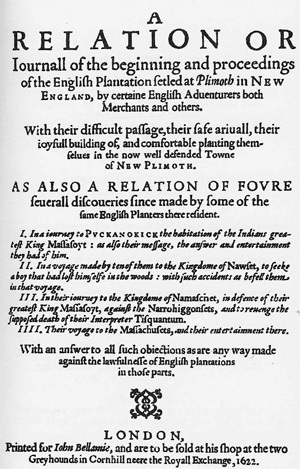 George’s name was used as the author of Mourt’s Relation, a 1622 account of the founding of Plymouth Colony, although the book is generally assumed to be the work of Edward Winslow and William Bradford, who were eager to attract more colonists to the enterprise. George Morton was born in Austerfeld, Yorshire, England on 2 August 1584 to George Morton and Catherine Bown. Juliana Carpenter was born 17 March 1584 in Wrington, Somerset, England to Alexander Carpenter and Priscilla Dillon. As this record indicates, they were married in Leiden on 22 July 1612. Registered The fourth of July 1612. George Morton, Englishman from York in England, a young man and merchant, accompanied by Thomas Morton, his brother, and Roger Wilson, [?] his acquaintance, with Juliana Carpenter, young daughter from Bath also lying in England, accompanied with Alexander Carpenter her father, Alice Carpenter her sister, and Agnes Robinson [?] her acquaintance. Zijn getrout voor Frans Adriaensz. van Leewen en[de] Jacob Paedts schepenen dezen XXIIIen [XXIIen?] july XVICXII. Aengeteyckent den VIen july 1612. Joris Morthen Engelsman van Jorck in Engelant jonghman en[de] coopman, vergesel[s]chapt met Thomas Morthen zijn broeder en[de] Rogier Wiltzoen zijn bekende met Julijaen Carpenter jonge dochter van den Baert mede gelegen in Engelant, vergeselschapt met Alexander Carpenter haer vader met Elsgen Carpenter haer zuster en[de] Agnes [?] Robbissen haer bekende. 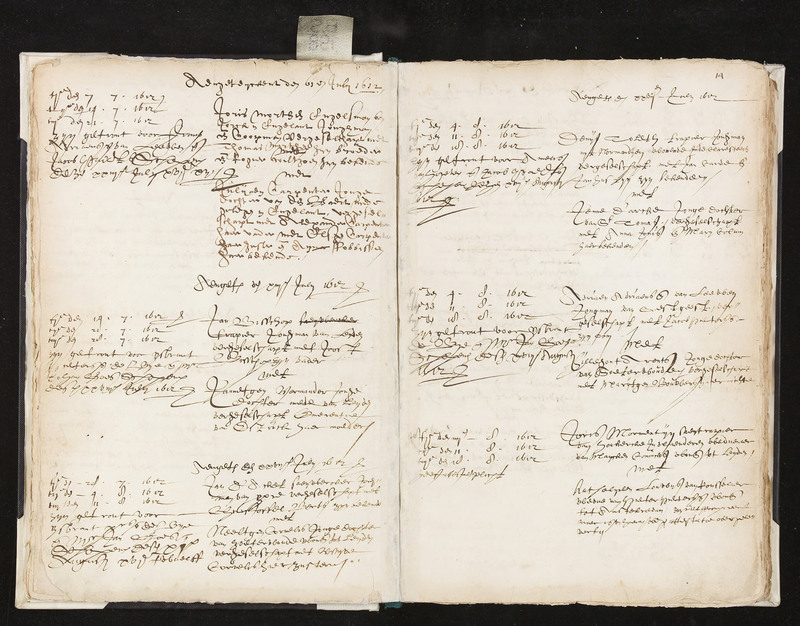 Not being an expert in Dutch or the script of the time, I have relied on a translation from a Dutch genealogy forum. So I can’t say exactly if the date shown is 23 July. According to The Great Migration Begins: Immigrants to New England 1620-1633, Volumes I-III, (Boston: New England Historical Genealogy Society, 2010 at americanancestors.org), George and Juliana were married on 22 July. This work is considered an authoritative source. The latter of the two forenamed, namely Mr. George Morton, was a pious, gracious, servant of God, and very faithful in whatsoever public employment he was betrusted withal, and an unfeigned well willer, and according to his sphere and condition, a suitable promoter of the common good and growth of the plantation of New Plimouth; laboring to still the discontents that sometimes would arise amongst some spirits by reason of the difficulties of these new beginnings but it pleased God to put a period on his days soon after his arrival in New England, not surviving a full year after his coming ashore. With much comfort and peace he fell asleep in the Lord, in the month of June, anno 1624. Some 400 years after her death, Nathaniel’s sister Sarah would gain fame as the subject of the popular children’s book Sarah Morton’s Day. 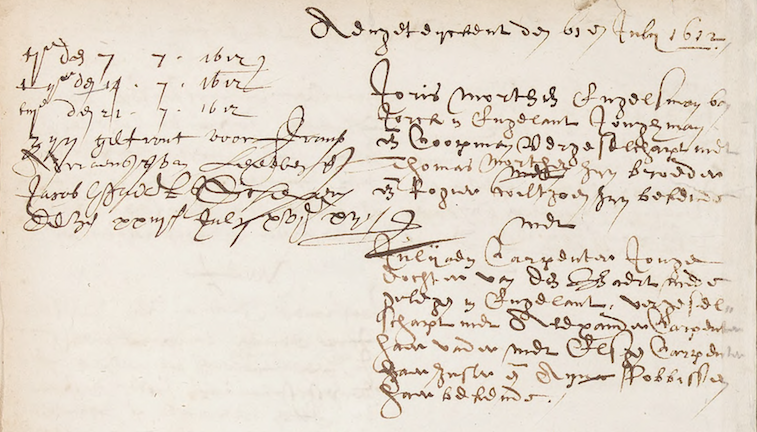 Marriage record of George Morton and Juliana Carpenter, Leiden, 22 July 1612. Their record is at top left, first page. Citation: Schepenhuwelijken (1592-1795), part: 198, Period: 1611-1633 Trouwen Gerecht B. juli 1611 – april 1633. Update: In the same register I found the marriage record for my 9x great-grandparents Deacon John Dunham and Abigail Ballou. Great what year did they leave Europe? wow you are good! And there was another Dutch Romance in your family, John Dunham and Abigail Ballou who were married in Leiden 22 Oct. 1622. This was John Dunham’s second marriage after his first wife died. Abigail Ballou was daughter of Thomas Ballou. Hi Gratia! Unfortunately I was not able to find the record for John Dunham and Abigail Ballou at the same source I found this one. This record still relates to the Deacon John Dunham line, however; as you know Nathaniel Morton’s daughter Mercy married Deacon John’s son Joseph!